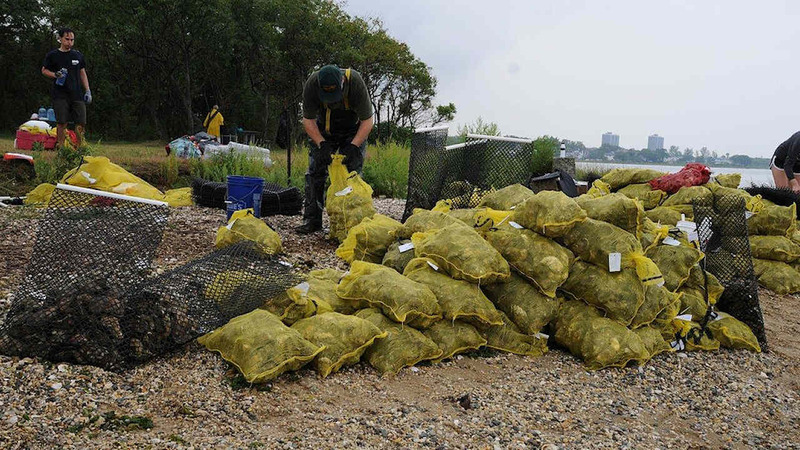 JAMAICA BAY, Queens (WABC) -- Mayor Bill de Blasio and the Department of Environmental Protection, in partnership with the Billion Oyster Project, announced that a project is underway that will see the installation of 50,000 oysters in Jamaica Bay. That's the largest single installation of breeding oysters in New York City. The New York/New Jersey Harbor was once blanketed by oysters, but due to over harvesting, dredging and pollution; they became functionally extinct decades ago. Oysters are widely recognized as a key component of a healthy marine ecosystem as they filter pollutants from the water, help to protect wetlands and shoreline from erosion and storm surge, and provide habitat for communities of fish and other aquatic organisms. Once the oyster installation is complete, water quality in the vicinity of the beds will be monitored for anticipated improvements in dissolved oxygen, nitrogen removal and turbidity. In addition, the beds will be evaluated for the recruitment of new oysters. The project is being funded with a $1 million grant from the U.S. Department of Interior, which is administered by the National Fish and Wildlife Foundation (NFWF). DEP is contributing $375,000. The Billion Oyster Project and students from the Urban Assembly New York Harbor School will assist with the installation and monitoring of the oyster beds. "This oyster bed will serve multiple purposes - protecting our wetlands from erosion, naturally filtering our water and providing a home for our sea dwellers are just a few. More broadly, this oyster bed is a small but necessary step in our broader OneNYC commitment to create a more sustainable and more resilient City. I'd like to thank the Billion Oyster Project and the students of the Urban Assembly New York Harbor School for assisting us in the installation of this oyster bed," said Mayor Bill de Blasio. The installation will include a central donor bed composed of 50,000 adult and spat-on-shell oysters as well as four smaller receiving beds composed of clam/oyster shell and broken porcelain. The porcelain was harvested from nearly 5,000 inefficient toilets that were recycled from the citywide water conservation program. Having reached reproductive maturity, it is anticipated that the adult oysters will spawn. The resulting fertilized eggs will grow as free-floating larvae in the water column until the young oysters will attach themselves to the shells of the parent oysters on the donor bed or onto any one of the four receiver beds. Once established, the hope is that the oysters will become self-sustaining, spawning seasonally and providing new recruits. The mission of Billion Oyster Project is to restore a sustainable oyster population and reignite a passion and appreciation for New York Harbor by engaging New Yorkers directly in the work of restoring one billion oysters.